I’m not a huge fan of films. I love watching them in the cinema and the whole romance of the cinema visit and I do in fact have a review planned of the Everyman cinemas because they are my favourite thing ever. But for re-watching over and over I don’t have that many favourite films. 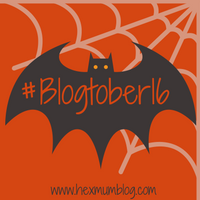 I think (and I’m a little embarrassed that this is my second Harry Potter related post this Blogtober) the Harry Potter films are my all time favourite films. As much as the books are my favourite books. I could read and watch over and over again. I’m not really sure why I love it so much, I think it’s the nostalgia of it having read them all as a child, as the books came out and the build up to them was almost like Christmas. I would get the new book first thing in the morning on the day of realise and then the race was on. I would cuddle up somewhere and read and read and read until I was finished and as the books got longer that meant literally staying up all night to read them. And then the book would pass through my family in order of reading speed until we had all watched them. Then as the films started coming out I feel like I grew up with them in my social life, going to see the first few with family but then as I grew older having them be some of my first trips out with friends by our selves. Until the final films actually coming out when I had already left home and going with friends and housemates as a young adult. Just the theme tune feels me with joy. In fact we must be getting to that time of year when they are played every weekend leading up to Christmas! I can’t wait. Only two years ago I finally got to go to the studio tours of the sets which Fabio had bought me tickets for as a present and we went with my big old baby bump when 30 something weeks pregnant. Best day ever!! And you can be assured that I plan to pass on my Harry Potter love to Harrison with the beautiful fully illustrated hard backs of the all the books they are slowly bringing out. It’s funny how there are some series (both book and film) out there which bring out this fanatical side of people you wouldn’t even begin to suspect!